The introduction of Group C regulations condemned the Lancia LC1 spyders, as the new rules, introduced in 1982 and strictly enforced in 1983, pushed aside both open spyders and cars not meeting certain fuel consumption requirements. The LC1 didn’t comply to either of these – enter the LC2. Teamwork was the keyword in the LC2’s development, which started during the summer of 1982. While the chassis was developed by Dallara, the engine was borrowed from Ferrari (another member of the Fiat group), with Abarth fine-tuning both. The gearbox was a very plain Hewland, which was known not to provide much trouble. The chosen 3.0-litre V8 saw its capacity reduced to 2.6-litre, while twin turbochargers guaranteed 650 hp – Porsche having announced outputs in the vicinity of 580 hp for its 956, the LC2 seemed the car to beat for 1983. Early in February 1983, Lancia unveiled its prototype in Pessione, near Turin, choosing as its stage the Martini museum – obviously not a coincidence, as Martini, after having been connected for years with Porsche, was now supporting Lancia. Unfortunately, the LC2 didn’t keep up its promises. A fast car, it was able to outpace the Porsches in practice, only to fall out of the races due to mechanical problems. Not only the Ferrari engines were prone to overheating, the Pirelli tyres didn’t last long – quite embarrassing in endurance racing. Pirelli became the source of more problems in the midst of the season when, also having to provide tyres for Formula One and rally racing, the Italian company decided to give up sportscar races. Dunlop saved the day for Lancia, but its crossplies were totally incompatible with the LC2. The new tyres were more durable though, which allowed Lancia to win the Imola 1000 km late in the season, beating all the private Porsches – the works cars were absent. Using the Dunlop efficiently required a complete redesign of the suspensions, which was carried out during the winter of 1983-84. Many minor modifications were also introduced to the 1984 cars. Expectations were even higher than, but as short-lived as in 1983. Sheer problems caused by brand new wheels forced Lancia to revert to its previous year’s wheels. As pre-season tests had been entirely conducted with the new wheels, the car’s behaviour suffered. 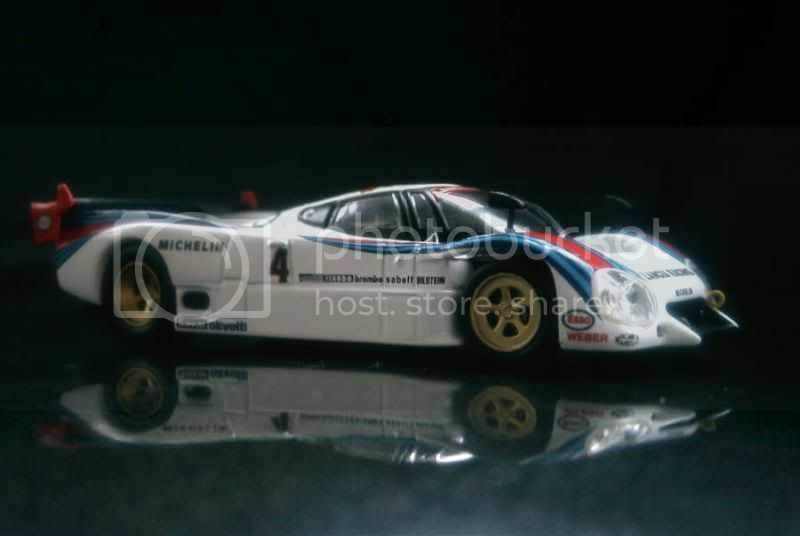 Despite better overall performances and the introduction at Le Mans of a larger 3.0-litre engine good for a staggering 830 hp, the LC2-84s still lagged behind the Porsche, or more exactly led their rivals until various problems pushed them down in the rankings. Skipping some races at the end of the season, Lancia succeeded in placing its cars in the first two spots at Kyalami – but most teams had boycotted the event due to the political situation in South Africa at the time. Much effort was put into developing the LC2 even further for 1985. Now ridding on good Michelin tyres, the LC2-85s proved even faster – but their reliability was still the cause of consternation. Though scoring five pole positions, the indication of a true potential, the LC2-85s were still behind the Porsche at the finishing line – that is, until Spa, where a tragic occurrence, Stefan Bellof’s accidental death, brought an abrupt end to the race and allowed the Lancias, which were then running in first and second places, to score their very first victory over the works Porsches. Euphoria, providing that there was to rejoice considering the circumstances of the win, didn’t last long, as during the next race in Brands Hatch, the two Italian cars made a pitiful demonstration, colliding with each other at Druids when victory was at hand. Once again, the season was shortened for the unfortunate team. While most people thought Martini would draw the curtain on the LC2, a lone car made a surprise come-back early in 1986. Despite a second place in a sprint race, all last hopes were soon given up. Privateers carried on with the LC2 until as late as 1991, but with more limited resources and an ageing car unsurprisingly didn’t fare better than the Martini Team had. 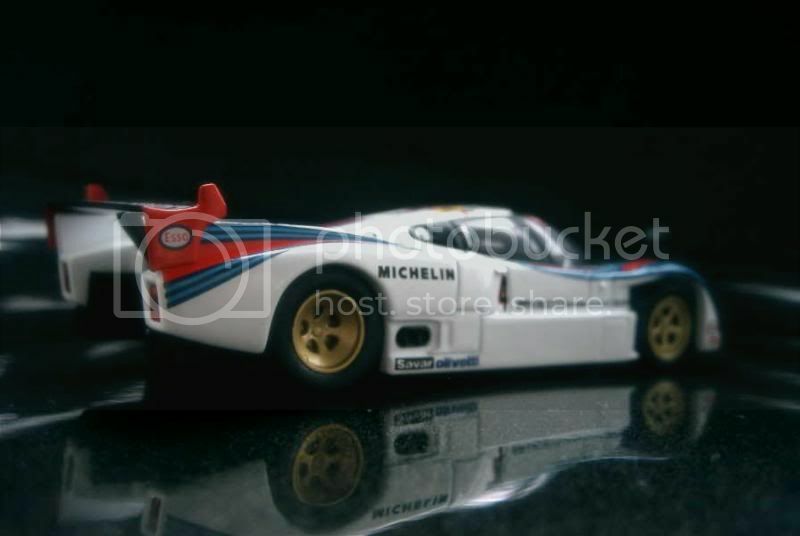 Ixo did a valuable job in reproducing the Lancia LC2, but since European legislators have unfortunately passed anti-everything laws, couldn't place "Martini" decals on its model. Apart from this sad detail, this die-cast is well worth 13/20.